Picture is from a trio who met in London and shared a common dream of opening their own restaurant. Tom, Alan and Colin worked together for many years within Michelin-starred restaurants before deciding it was time to begin their own venture. Picture Fitzrovia opened in June 2013 and quickly established itself as part of the local community. Close relationships have been formed with many locals who return frequently. The team also enjoy welcoming those guests travelling to us from further away for a special lunch or dinner experience. 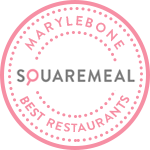 Picture Marylebone opened on July 4th 2016 and offers the same exceptional food and warm hospitality that it’s older sister is known for. Offering value will always be a key part of the ethos. Alongside the a la carte menu, a six course seasonal tasting menu is always available at £45. These menus have become increasingly popular and are an enjoyable way to sample all of our current favourites. Corporate discounts are available for local businesses. Please contact us by calling 0207 637 7892 or by emailing info@picturerestaurant.co.uk to set up the discount for your company. Once your company is registered with us we will provide your 'Neighbourhood Cards' to show when dining. The card will entitle diners to a 10% discount. Please note the discount will only apply to groups with a maximum of four diners. For reservations of more than 5 guests, or if you can't find the time you are after, please call or email the restaurant you are trying to book and we will try our best to fit you in. Please note that we may require your table back after two hours. There are no instagram posts.